TL;DR: In this article, we're going to be creating a couple of very simple Node applications and hosting them on a DigitalOcean droplet using Dokku, an open-source PaaS. We'll also be looking at how to optimize the deployment using Docker. You do not strictly need any software other than Git and a text editor to follow along with this article, as most of the work is done on the Dokku server. As long as you have cloned the sample application, you can perform most of the steps in this tutorial. However, installing Node and Docker is highly recommended as we're going to be doing some local testing before deployment to make sure that everything is working as it should. If you would like to follow along, you should have the latest version of Node installed. You should also install Docker for Developers for your operating system. Docker is a container platform that allows us to package up applications and services, distribute them and run them in a consistent environment. We're going to be using it in conjunction with Dokku to package up a Vue.js application and run it on a remote server. As the process of deploying applications to a Dokku server revolves around Git, make sure you have Git installed on your system before you start. "Learn how to easily set up a Dokku server and deploy applications to it using Git"
Dokku — The smallest PaaS implementation you've ever seen — is a piece of open-source software that "helps you build and manage the lifecycle of applications". It uses Docker under the hood to create and run applications inside containers. Dokku supports Ubuntu 14.04/16.04, Debian 8.2 and CentOS 7 platforms, and has a very small team of core maintainers. They have a variety of ways you can get in touch if you need help, including IRC and Slack. They also have complete documentation available online. In essence, it allows you as a developer to push applications to it using Git where it will build those applications for you, package them into a Docker container, and then manage the lifetime of that container on your behalf. It will also automatically configure Nginx so that your application can be reached, with its virtual hostname support. When you push an application, it builds the app using the official Heroku Buildpacks, and so if your app already works on Heroku, it's probably going to work here. If the buildpacks don't cater to your needs, you can customize the build process by providing your own Dockerfile, and Dokku will use that instead. We're going to see both of these approaches to working with Dokku in this article. Dokku provides a nice balance between cost (Dokku itself is open-source and free), features and control. With Dokku, you get a generously-featured platform on which to install your apps that supports Git deployment and lifetime management out-of-the-box. All of the configuration that enables those two things to work is taken care of for you. Dokku can be hosted on a $5 DigitalOcean droplet, and so the more apps you can host on this box, the more cost-effective it will be when compared to hosting them on other big-brand platforms. Bear in mind that you do not have to use DigitalOcean to host your Dokku server — if you have an existing compatible Linux server that's not doing much, you could put it to good use by installing Dokku on it! For Dokku, there is no official web interface for managing through a browser - it's command-line only. For some people, that may be a turn-off. Community attempts have been made to establish a web front-end for Dokku but none have really broken through as being the application to use. That being said, the Dokku CLI is very simple to learn. Also, the plugin system heavily uses Bash which may or may not be your cup of tea. For authoring plugins, it would be much nicer if they could be written in a more friendly scripting language. But don't let those things put you off — let's get started! Now that we have our app, let's create our platform. If you already have a DigitalOcean account, log in now. Otherwise, register for a free DigitalOcean account now. By registering using this link, you automatically get $10 worth of credit added to your account, meaning that you won't have to pay to complete this tutorial. Once you are into your control panel, click the 'Create' button at the top of the screen and choose 'Droplets'. On this screen, we need to select "One-click apps" and choose "Dokku 0.12.13 on 18.04" (the actual version numbers may vary). Note: You may need to scroll to the left to see the $5 option. With this option, we get a machine that has a 1GB of memory and a 25GB SSD hard-drive, which is enough to host a few small apps. To put that into context, after deploying the basic Express application below, I still had 621MB of RAM and 21GB of disk space available. After deploying the Vue.js application, the available RAM reduced to 586MB, while the available disk space only reduced by a small amount. 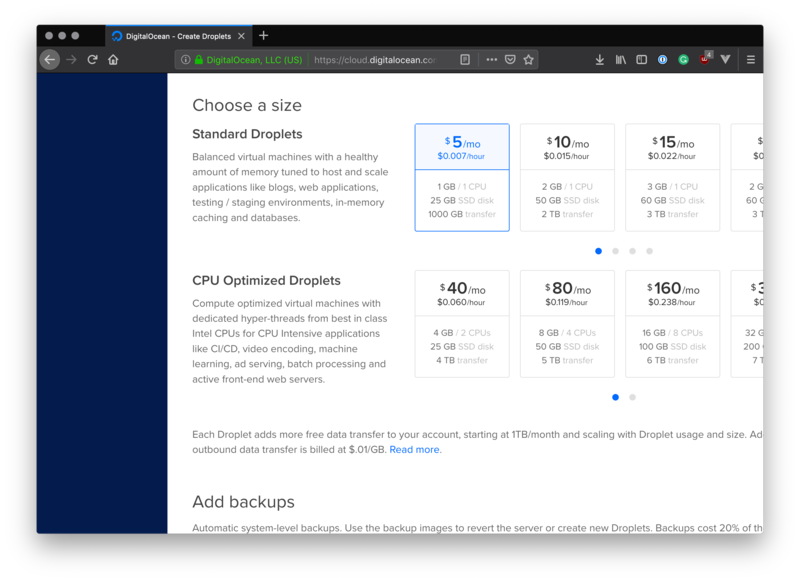 The amount of applications you can fit on a $5 DigitalOcean droplet will vary depending on the size and complexity of the applications you want to host. Fortunatly, in most cases you can upgrade a Droplet at any time should you need more resources! The next thing you'll be asked when you scroll down is what region you want your droplet to be in. Select any region that makes sense for you. Finally, we need to add an SSH key so that we can log in to the server. Scroll to "Add your SSH keys" and click the "New SSH key" button. Copy and paste your machine's public key into this box, give it a name and press "Add SSH key" to finish. Note: Your public SSH key is usually available in the .ssh folder inside your home directory. On Linux and MacOS, this is usually ~/.ssh/id_rsa.pub. On Windows, try C:\Users\<username>\.ssh\id_rsa.pub. 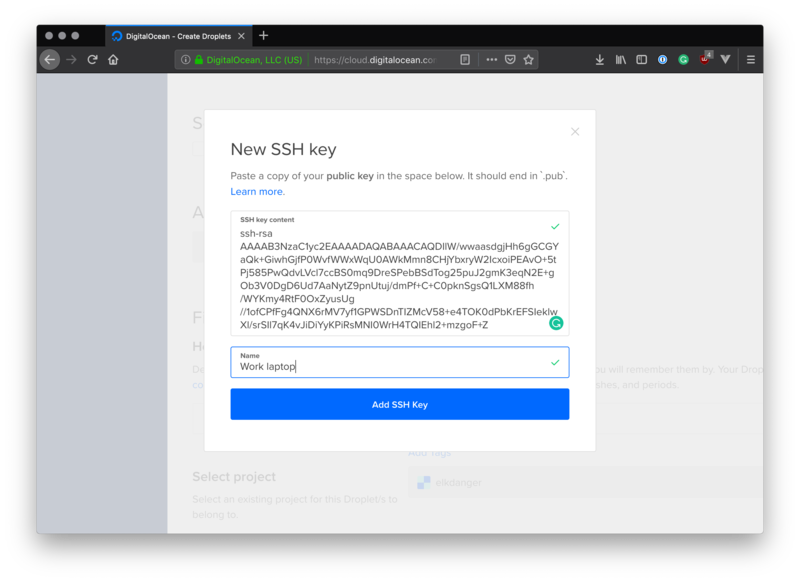 If you have not previously generated an SSH key pair, follow the instructions on GitHub.com to generate a new SSH key and add it to the ssh-agent. Once the public key has been created, try the previous step again. Finally, press the "Create" button at the bottom to create the droplet. It will take a few minutes for it to be available. Once the Droplet has been created, it will have an IP address. Copy the IP address into your clipboard, and open a terminal. We're going to use SSH to connect to our Droplet. Note: Your IP address will be different to mine, so make sure you use the one that you copied from the DigitalOcean Droplets panel. 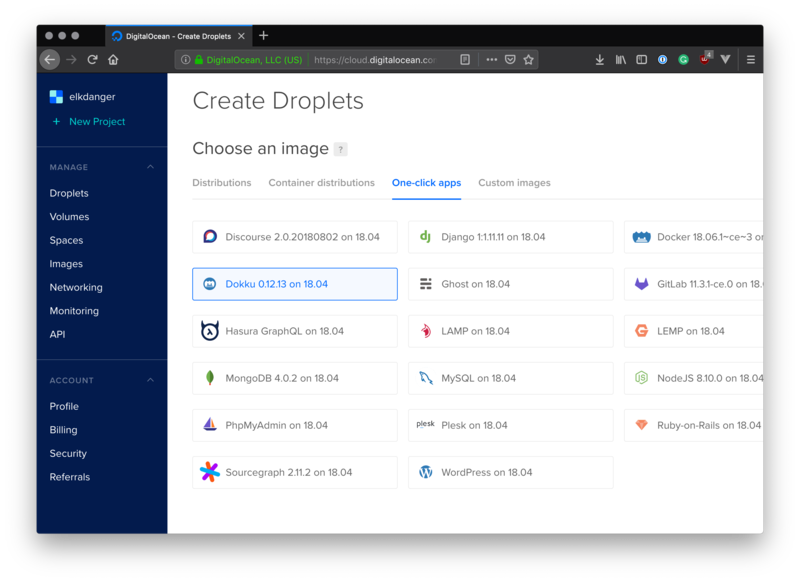 Welcome to DigitalOcean's One-Click Dokku Droplet. To keep this Droplet secure, the UFW firewall is enabled. 2375 (Docker) and 2376 (Docker). Note: You may find that your SSH connection will drop with the message "Please wait while we get your droplet ready...". If that's the case, your Droplet may still be performing some initialization steps, even though the Droplets panel said it was ready. Just try again in a few minutes. Here you are asked to provide your SSH key. Since we have already provided it in a previous step when we initially set up the droplet, this should be pre-filled. The next thing you need to do is decide whether or not to use virtualhost naming for your apps. I have a domain I'm going to use for this example, so I will tick the box. Note: For this to work, you must configure your domain's DNS with an A record that points to your Dokku server. In my example, I'm using a domain simplicode.co.uk with an A record of * that points to my server at 46.101.88.57. This means that any traffic that goes to a subdomain e.g. http://my-app.simplicode.co.uk will be routed to my Dokku server and Nginx will route it to the correct place. Also, note that changing your DNS settings may require a bit of time for the changes to fully take effect. With that done, click "Finish Setup" to proceed. Your Dokku server is now ready to go! Let's try deploying a simple Express application and see if we can reach it on the internet. To create this application, you can follow the steps below, or you can clone the demo repository to get a head start. To test it, run npm start from the terminal. Then, browse to http://localhost:3000 in the browser, and you should see the words "Hello, Dokku!" on the screen. Now that we have our simple application, we'll create a new Git commit so that it can be pushed up to the Dokku server. Since Dokku uses Git to deploy applications, every change you make that you want to deploy to the server must exist in Git at some stage. Otherwise, the changes won't be pushed. The remote URL dokku@example.com:express-demo contains the application name we want to use (the express-demo) part. If you are using virtualhost naming, this name will form the subdomain part of the URL that you use to access the application. i.e. http://express-demo.example.com. Finally, use git push to push your application to the server. This will kick off the build process using the Node buildpack and — if all goes well — deploy it! You will start to see a lot of logging information spill out into the terminal, telling you how the build process is going. After a couple of minutes, the build should finish and your site should be available. To test this, try to access the application in your browser. If you are using virtualhost naming and a domain, you should be able to reach it at http://express-demo.<your domain name>, or http://<your IP address> if not using a domain. Once you're logged in, use the dokku command to show the available commands that Dokku has to offer. Using dokku enter express-demo, you can step into the running container and run commands that way too — give it a try! What we did in the previous step was to deploy an application to the server using Git, which uses the Heroku Node buildpack to build our application using established Node conventions. This works great for a simple Node app like the one we created in the previous section, but what about a more complex application? To get around these issues, let's use a Dockerfile to customize our own build steps and cast aside the Heroku buildpack entirely! Again, you can either follow the following steps to create the Vue.js application and add the Dockerfile, or you can clone the example repository with all of this stuff in it. # Copy our package.json file first, then run `npm install`. The Dockerfile contains a second stage which takes these static assets and copied them into a new container. The app is then served using http-server, which is a Node application that can serve static assets from a folder using sensible defaults. The reason we use these two stages is so that the resulting Docker image is much smaller and efficient. There's no point in including all of the source files and Node packages in the image when they're not going to be used! Note: .dockerignore files work in a very similar fashion to .gitignore files. Docker ignores files that match items in this file when performing COPY operations. docker build -t vue-demo . This will create a new Docker image from the Dockerfile in the current directory. Docker will execute all the steps inside the Dockerfile, including downloading the Node 10 image, copying the files and running npm install. Do not forget the period on the end, as that is a pointer to the current directory. Note: The -p switch specifies the port mapping. Even though the application starts up on port 8080, it can be mapped to another port when the container is started. Without this though, the application won't be visible in the browser, as Docker will not forward the port. The application will spin up in the same way as if it had been started using npm run serve. Test this in the browser by browsing to http://localhost:8080 — you should see your application running! git add . && git commit -m "Added a Dockerfile"
This time, Dokku will detect that a Dockerfile is present and use that to build the image containing your application. Note that when using Dockerfile deployment, Dokku will try and set up the proxy with the same port that has been exposed in the Dockerfile (port 8080 in our case). Unfortunately, this means that by default, the application will only be available on port 8080 when it is deployed. We may find that when we try to access the application now, that we won't be able to see it. Or, we will see "Hello, Dokku!" being displayed from the Express application we created earlier. This will add a mapping on the http scheme from host port 80 to container port 8080. Now we should be able to see the application when we browse to http://vue-demo.<your domain>, or http://<your IP address> if not using virtualhost names. 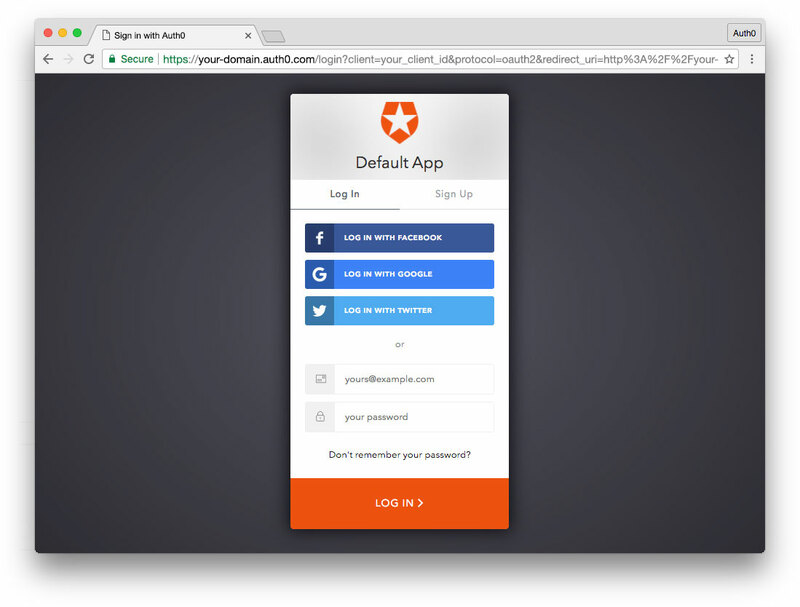 To demonstrate how easy it is to get up an running with SSL and make your Dokku apps more secure (free of charge! ), let's add the Let's Encrypt plugin and set our application up with an SSL certificate. Note: If you are not using virtualhost naming with your Dokku server, you will not be able to complete this step, as Let's Encrypt do not offer SSL certificates for IP addresses. Here you should swap <your email address> for your own email address. This is used by Let's Encrypt to notify you when the certificate is about to expire. Note: Normally when you add in configuration, Dokku will automatically restart the application for you. We don't need that in this case, so the no-restart flag prevents that from happening. The plugin will request and retrieve the SSL certificate from Let's Encrypt, store it on the server and then configure the SSL port for your application. It will then reconfigure Nginx to automatically use SSL when accessing your app. As a result, you should now have an SSL-enabled app! 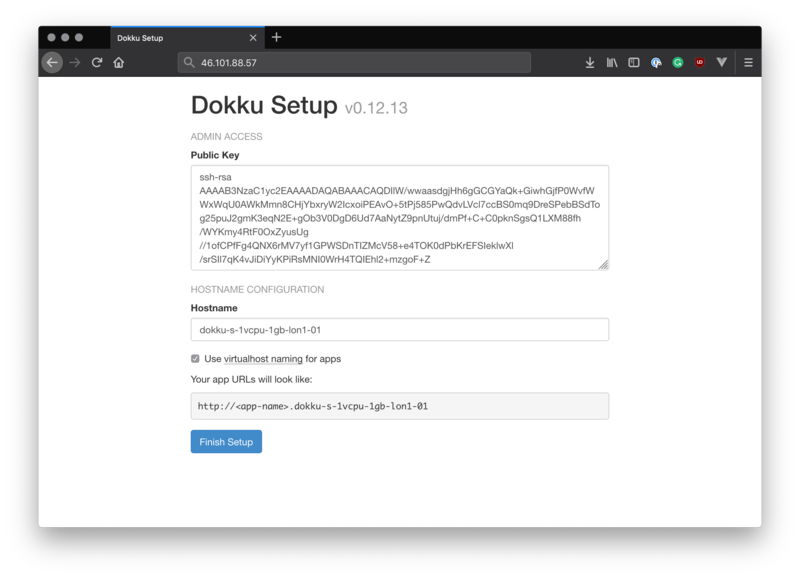 "Add Let's Encrypt support to your Dokku applications using the official plugin"
We can protect our applications and APIs so that only authenticated users can access them. Let's explore how to do this with a Vue application and a Node API using Auth0. You can clone this sample app and API from the vue-auth0-aside repo on GitHub. Authentication service uses a subject to propagate authentication status events to the entire app. Access token and token expiration are stored in local storage and removed upon logout. You'll need an Auth0 account to manage authentication. You can sign up for a free account here. Next, set up an Auth0 application and API so Auth0 can interface with a Vue.js app and Node API. Go to your Auth0 Dashboard and click the "create a new application" button. Name your new app and select "Single Page Web Applications". In the Settings for your new Auth0 application, add http://localhost:8080/callback to the Allowed Callback URLs. Scroll down to the bottom of the Settings section and click "Show Advanced Settings". Choose the OAuth tab and verify that the JsonWebToken Signature Algorithm is set to RS256. If you'd like, you can set up some social connections. You can then enable them for your app in the Application options under the Connections tab. The example shown in the screenshot above utilizes username/password database, Facebook, Google, and Twitter. For production, make sure you set up your own social keys and do not leave social connections set to use Auth0 dev keys. Go to APIs in your Auth0 dashboard and click on the "Create API" button. Enter a name for the API. Set the Identifier to a URL. In this example, this is http://meetupapi.com/. The Signing Algorithm should be RS256. You can consult the Node.js example under the Quick Start tab in your new API's settings. We'll implement our Node API in this fashion, using Express, express-jwt, and jwks-rsa. 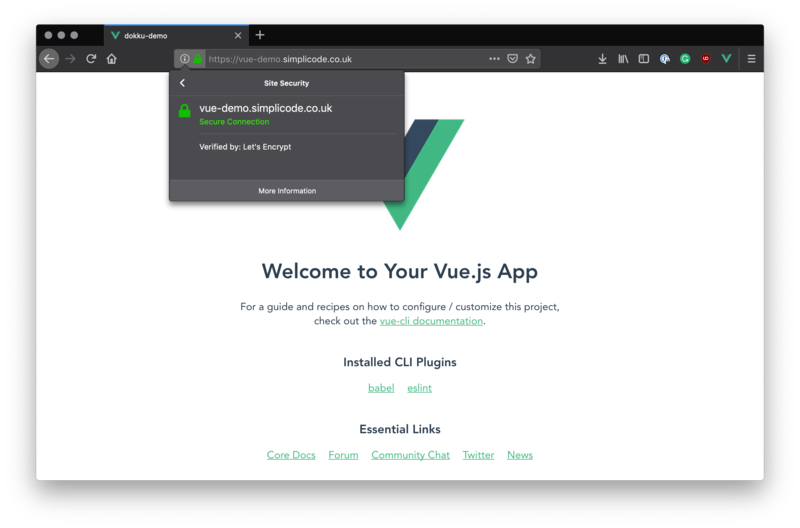 We're now ready to implement Auth0 authentication on both our Vue client and Node backend API. The Node API is located in the /server folder at the root of our sample application. Change the CLIENT_DOMAIN variable to your Auth0 application domain and set the AUTH0_AUDIENCE to your audience (in this example, this is http://meetupapi.com). The /api/examples/private route will be protected with express-jwt and jwks-rsa. Note: To learn more about RS256 and JSON Web Key Set, read Navigating RS256 and JWKS. Our app and API are now set up. They can be served by running npm run dev from the root folder and node server.js from the /server folder. With the Node API and the Vue.js app running, let's take a look at how authentication is implemented. Authentication logic on the front end is handled with an Auth authentication service: src/auth/Auth.js file. Replace the constants, AUTH0_DOMAIN, AUTH0_CLIENT_ID, AUTH0_API_AUDIENCE with values from your Auth0 dashboard. Replace CALLBACK_URL with http://localhost:8080/callback. The login() method authorizes the authentication request with Auth0. An Auth0 login page will be shown to the user and they can then log in. Note: If it's the user's first visit to our app and our callback is on localhost, they'll also be presented with a consent screen where they can grant access to our API. A first party application on a non-localhost domain would be highly trusted, so the consent dialog would not be presented in this case. You can modify this by editing your Auth0 Dashboard API Settings. Look for the "Allow Skipping User Consent" toggle. We'll receive accessToken and expiresIn in the hash from Auth0 when returning to our app. The handleAuthentication() method uses Auth0's parseHash() method callback to set the session (setSession()) by saving the tokens, and token expiration to local storage. The isAuthenticated method informs the components in the app about the user's authentication status via checking the access token's expiry time. Finally, we have a logout() method that clears data from local storage. The callback component is where the app is redirected after authentication. This component simply shows a loading message until the login process is completed. It executes the handleAuthentication() method to parse the hash and extract authentication information. In order to make authenticated HTTP requests, we need to add an Authorization header with the access token in our meetup-api.js file. A Private meetup page component can show information about private meetups. However, we only want this component to be accessible if the user is logged in. 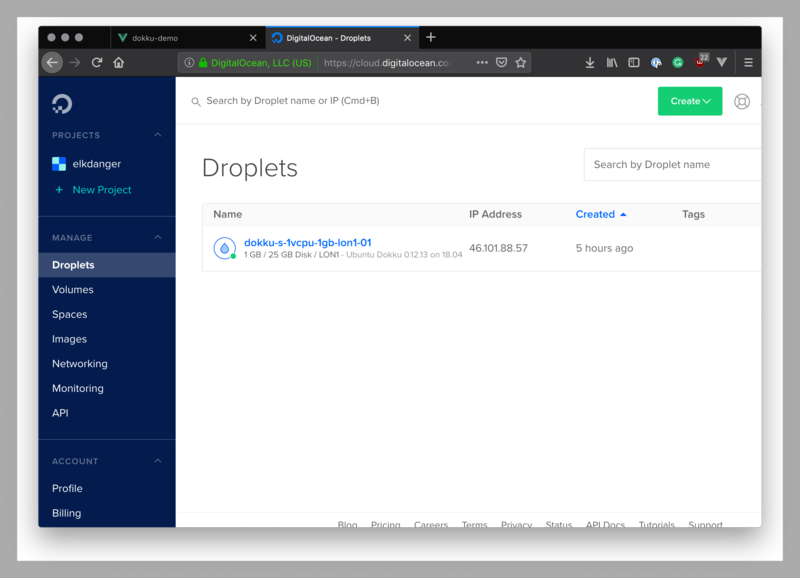 In this article, we saw how to set up a new Dokku server using a DigitalOcean Droplet, and then deploy a simple Express application to it using Git Deployment. 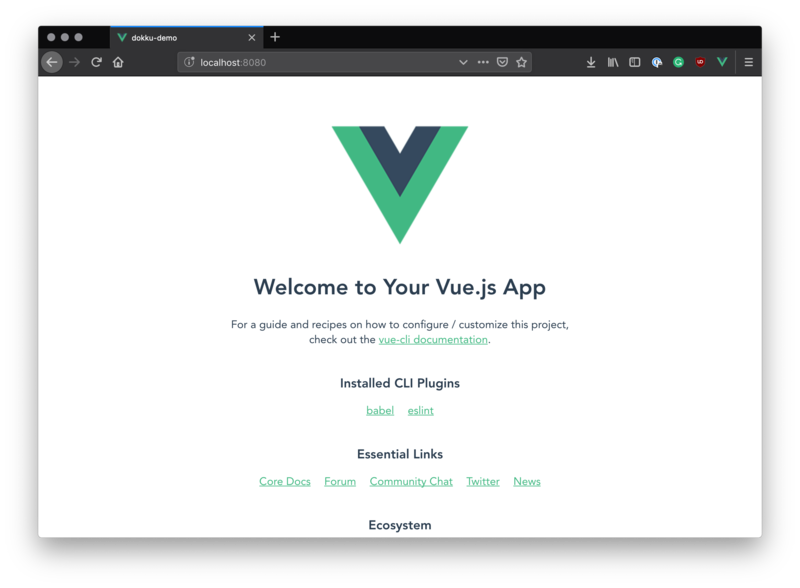 We then added a Dockerfile to customize the build process for a Vue.js application, creating a multi-stage build that used Vue's built static assets to create a small, optimized Docker image. We also learned some of the basic Dokku commands, such as dokku apps, dokku proxy and ran the ls command from inside the app container. Finally, we used the Let's Encrypt dokku plugin to SSL-enable our Vue app.